or the presence on new communication channels and much more. All of the above aspects bring enormous value to hotels, and especially the last one is key to innovative customer communication. Unfortunately, it’s exactly that aspect that is widely ignored. However, a multi-channel presence, may it be for customer service, marketing or sales purposes, is a must nowadays! Google Assistant is already available on more than 1 billion devices worldwide. Whether it’s through text with chatbots on websites or messengers, or via voice commands through Amazon Alexa, Google Assistant & co, conversational interfaces are transforming the communication between companies and end users. 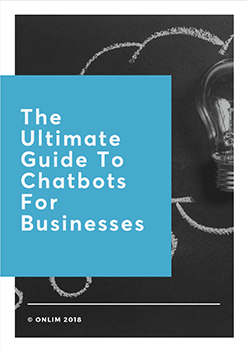 From planning your trip, to making a reservation or booking, to requesting help with the purchase of additional packages on-site, chatbots and voice assistants can add huge value to the hospitality industry. They allow hotels to provide information about the hotel itself, the availabilities, the surroundings, the weather forecast or special offers. Digital assistants can not just provide answers to any related requests, but also help in converting them into bookings. Right now, these communication and distribution channels offer great potential for the hotel industry, but it will certainly not stay like this forever. Once large booking platforms have conquered these channels, it will become more difficult for an individual hotel to stand out and get their potential customers’ attention. The time for hotels to get onto these channels themselves, to engage in direct communications with customers and to gain experience truly is now! At Onlim we specialize in automated customer communication through chatbots and voice assistants. To learn more about our solutions, click here.